Watch the 2019 Dubai International Basketball Championship Semifinals between the Mighty Sports and the Al Riyadi. Scheduled February 9, 2019 at the Hall Al Ahli Club - Dubai. Tip off at 12AM (Manila Time). 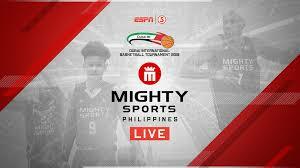 The Mighty Sports ended theor elimination round with a record of 4-0 at 1st spot in the Group B standings, they also defeated the Oil Sports in the quarterfinals last Feb 7th. On the other hand, the Al Riyadi ended their elimination round with a record of 3W-1L and at the 2nd spot in Groub B. They defeated the Al-Wahda - Syria in the quarterfinals last Feb 7th. AL RIYADI 89 – Arakji 23, Johnson 20, Saoud 12, Abdelnour 10, Abdelmoneim 9, Gyokchyan 8, Obekpa 7, Bowjee 0, Khatib 0. MIGHTY SPORTS 84 – Brownlee 24, Morris 21, Gray 17, De Liano 8, Brickman 8, Adams 4, Santillan 2, Odom 0, Banal 0. Quarterscores: 26-20, 54-40, 76-67, 89-84.